There are a few options you have to make your services talk to each other. In this post we're going to have a quick look at them and I'll give links to resources to learn more about each option. Note that we're going to look at direct communication between services. Brokered communication is another integration option that has its pros and cons but there is nothing specific to Service Fabric. The first option is to make your services resolve endpoints of others directly through the Naming service. Service Fabric SDK provides you with ServicePartitionResolver component that makes it easy to resolve a remote service endpoint by its canonical name, i.e. 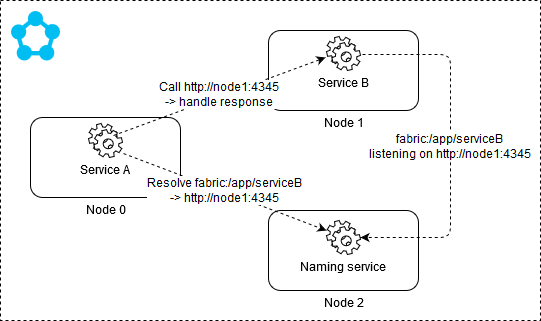 fabric:/app/service. It works both for stateless and stateful services and across applications as well. The SDK also provides ServicePartitionClient that implements caching of resoled endpoints and Retry pattern when you call them. In this post I've covered this option in detail and also gave an example of how to implement an AutoRest based client library that relies on ServicePartitionClient. It's also clear from that post that this option requires some added implementation effort on the client library side but in the end consumers will be able to build their proxies with dependency injection and configuration and they will get Retry for free. Another option is setting up the reverse proxy in your node type(s). Once configured the proxy is running on all nodes in those node types where you chose to enable it. Your services simply issue calls to localhost:[reverseProxyPort] and let the proxy handle remote service endpoint resolution and calling of the remote service. Exposing Kestrel or Node based services to the outside world. Exposing Kestrel or Node services over HTTPS (you will need to configure a certificate for the reverse proxy). SSL termination occurs at the reverse proxy. The proxy then uses HTTP to forward requests to your services. As of runtime 5.6 you can enable HTTPS all the way to your services. Exposing stateful services to the outside world. Stateful services can't be directly exposed as there is no way for the load balancer to know which nodes replicas of a particular partition are running on. You need to either provide a stateless façade as mentioned here or use the reverse proxy. In this version of BookFast I've implemented service client libraries and consuming proxies so that they can be used with the reverse proxy. Note that the client libraries are universal, i.e. they can be used both through the ServicePartitionClient or through the reverse proxy. I had to make changes to AutoRest generated classes to support partition keys when calling stateful services. The problem is that partition keys are specified as query string parameters and currently AutoRest does not generate code that accepts optional query string parameters. As of runtime 5.6 you can set up a DNS service in your cluster that enables endpoint resolution using the standard DNS protocol. For non-default services you can specify their DNS name as a new -ServiceDnsName parameter to New-ServiceFabricService cmdlet. Consuming services will then use the DNS name in the URL when calling other services. The DNS service provides mapping between DNS names and canonical service names. Once the canonical name is determined the DNS service resolves the actual endpoint address through the Naming service and returns the address to the caller. It's a pretty straight forward way to call stateless services and will also be useful especially in 'lift and shift' scenarios. It won't work with stateful services though as you need to be able to resolve a particular partition and replica to communicate with.